The Style Ref | The Fashion Authority for Work, Play & Gameday: It's Time to "Get Pumped"
It's Time to "Get Pumped"
Here's a tip, boys: The way to a woman's heart is through her feet. It's no secret that women love shoes, a guilty pleasure known to cause varying amounts of physical and financial distress. Although TSR typically recommends casual, comfortable fashion for female sports fans, it's always fun to inject a little team spirit in unexpected places. If you love shoes and sports, get ready to fall in love with Get Pumped. Gina Corrao, a senior graphic designer at Million Dollar Media in Woodbridge, NJ, started Get Pumped by accident. 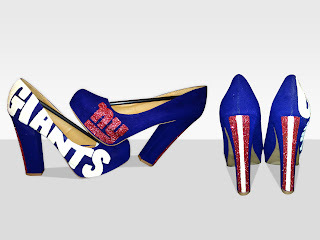 Her office colleague was a diehard New York Giants fan and in celebration of her 30th birthday, Corrao decided to make her a pair of Giants-themed pumps. She did it jokingly, hoping it would be a fun surprise, but little did she know where those shoes would take her. Corrao teamed up with the girls from her All Girls Fantasy Sports League and made a pair for New York Knicks sideline reporter Tina Cervasio. She did and the Knicks noticed. The team purchased 26 pairs for their dancers and now, Corrao's shoes are considered the "official dress shoes of the Knicks City Dancers." Corrao's creative process is collaborative and flexible. Customers can create their own design or rely on her skills to transform these shoes into their own personal fashion statement. 1) Comment on this post to tell TSR which team you'd feature on your pumps (be sure to include your name, too). 3) "Like" Get Pumped on Facebook. The deadline to enter is Friday, March 30. One winner will be randomly selected and notified via e-mail. TSR is so "pumped" for this giveaway! Can't get enough of these shoes? Check out Get Pumped's website, Facebook and Twitter! For more information, contact handpaintedpumps@gmail.com. omg these are sooo cool. and how awesome that it was all by ~accident!! Would definitely love Washington Nationals heels. The team is about to have a big season, and I want to rep my team well! My name is Colleen and I would have the Washington DC Capitols shoes. Hockey is my favorite sport and their my favorite team! Would love to be able to wear them to the games!! OMG!!!! i MUUUUST have these! USF Bulls (naturally) or if we're only doing pro teams i'll go with the Red Sox or Magic :) TSR has been finding the most awesome fashions ever! keep up the good work LOVE IT! OMG! Love love love these shoes! Of course I'd have to go with my lovely Florida Gators! the shoes are fab! would love a pair of custom Michigan shoes. GO BLUE! So cute! USF all the way! All these shoes are fabulous!! Would love a pair Gator Style!! It's great to be a Florida Gator!!! Karin would love Giants, Knicks n even a pair of Yankees shoes would be awesome. 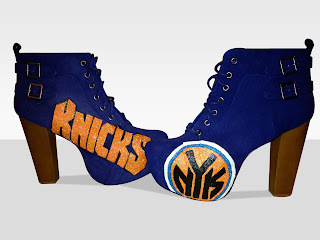 My name is Kelsey and I would DEFINITELY LOVE the New York Knicks pumps or booties!! I bleed that Blue and Orange and i would absolutely die for a pair of those!!!!! 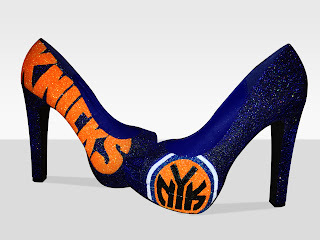 Love love love those Knicks pumps! <3 I remember seeing pictures of Tina Cervasio wearing them and they are just awesome! I'm such a big Knicks fan and would totally rock them! Of course it would have to be my USF Bulls! :) I am so short that I love me some big girl shoes! What a fabulous idea! I can see it now, a sparkly pair of green and gold pumps strutting down the street showing some love for the one and only USF Bulls. That'll turn a head or two... :) Gotta love my Bulls! I wouldn't shame a gorgeous pair of pumps with a team mascot other than the Buffalo Bills. :-) Afterall, they are the REAL New York team!!! THESE ARE SOO KICK A$$! WHAT A FAB IDEA!! ORLANDO MAGIC ALL THE WAY!!!!!! I am a huge shoe fan and these are awesome! If I won, (fingers crossed), I would have to bring some south to the designs. I would kill for USF shoes, but if it had to be pro teams, some beautiful teal and orange Miami Dolphins pumps would be adorable! Love the blog girl..keep it up! Cheers to this business venture, LOVE it! If i do not win, I hope Theresa does. Buuuut i want to win- why? because i love wearing heels. I would want Philadelphia Flyers heels. They will be the easiest to make because their colors are black and orange. Since the Flyers most likely always make the playoffs, and since the hockey season is extremely long, in a great way, i can sport these beauties with Jeans and my Jagr or Pronger jersey, or a cute LBD. Love your blog and I hope hope HOPE i win! These shoes are awesome!!! I would rep my alma mater and favorite nfl team by getting a pair of Ravens heels! These are so hot!! I would love to own Cowboy pumps! Wow!!! What an amazing giveaway! These are some of the coolest shoes I've seen in a loooong time! 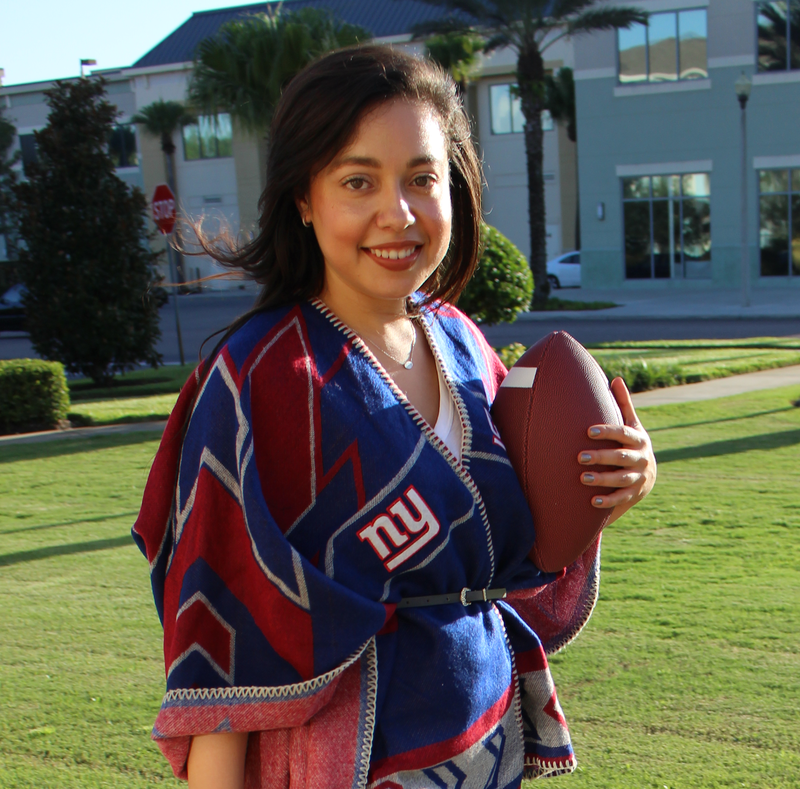 It can be so hard to find fun fashionable pieces to help you support your team- what a great idea! I'd love a pair to celebrate my San Diego Chargers! I'm an email subscriber and like Get Pumped on FB as Katy M.
These are most definitely, HOT!!! Would love a paid of Denver Broncos pumps! The best of luck with your awesome talent! Susan K.
These are so stinkin cute! I would rock the Orlando Magic! I would love a purple and orange pair to rock for the Clemson Tigers! If it has to be a pro team, I'd like a pair for the Patriots! I think I'm in love! Amazing creation love the Knicks pumps! AWESOME idea! I would love to have a pair of NC State heels! I would be the ONLY gal at the tailgates in custom pumps! Go Pack! I would rock these in black and gold - Pittsburgh Steelers babaaaaay! Just found this website thru Ladies of DC! What a great idea, I'm a fan of Washington Nationals... Love the website too! I love the combo of style and sports. I would LOVE LOVE LOVE the New York Knicks pumps or booties!! Or Washington Redskins ... I'm torn I just moved from NY to DC but the Knicks were a big client of mine and I'm a huge supporter!!!! These shoes are AMAZING!!! I'd be happy with Miami Dolphins, NY Mets or Maryland Terrapins...whatever is more fun for her to make!! Such great pumps! Washington Caps would be my team of choice! Team of choice: Washington Redskins. Without a doubt - Yankees!!! Love love love these shoes! I'd rock the Washington Capitals red, white and blue! These are soo cute !!! 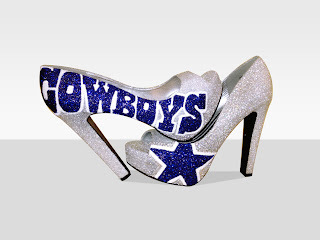 I'd love a pair of Jets heels to impress our new and our old quarterback with ;)... I'm sure Mark & Tim would love these !!! These are awesome! I'm a graphic designer too in Boston and this concept is just down my alley. I'm really hoping to get picked. Great work!! I would want a Syracuse pair of shoes!!! Love this! Oh wow, these are great! I love the bold graphics mixed with girlish charm. So many hometown teams to chose from-- Rays, Bulls, Storm, Lightning, FC Tampa Bay-- but I would absolutely love a pair of Get Pumped shoes for the Lightning. Thanks for introducing us to this great product, TSR! Hi my name is Corina Juarez and I LOVE the Dallas Cowboys!! Having some custom made heels would be so wonderful!!!! PLZ PLZ pick me!! Outlook Customer Care Those are some fabulously bold shades!! I love Extraordinary!oh my gosh I totally love your picks!